Only a few days after BMW Group unveiled its VISION NEXT100 trio of concept cars - for Mini, BMW and Rolls-Royce - it's taking a bold step in the direction of fully-autonomous vehicles. Intel and Mobileye will collaborate with BMW for an autonomous production vehicle ready for sale by 2021. The new car, called the iNEXT, will be the next step in BMW's driver assistive technologies. While the goal is a full level 5 (driverless) vehicle, the iNEXT would also go through the other stages of automated driving from semi- to fully-autonomous. "Today marks an important milestone for the automotive industry as we enter a world of new mobility," said Mobileye Co-Founder, Chairman and CTO Professor Amnon Shashua. 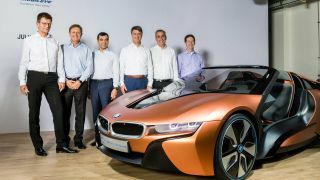 "Together with BMW Group and Intel, Mobileye is laying the groundwork for the technology of future mobility that enables fully autonomous driving to become a reality within the next few years." While the new technology will be fully autonomous, BMW has already stated that their cars will always feature a self driving mode, called 'Boost', for those who still desire the Ultimate Driving Machine. However, that driving machine will still be full of driver assists. "Highly autonomous cars and everything they connect to will require powerful and reliable electronic brains to make them smart enough to navigate traffic and avoid accidents," said Intel CEO Brian Krzanich. "This partnership between BMW Group, Intel and Mobileye will help us to quickly deliver on our vision to reinvent the driving experience. We bring a broad set of in-vehicle and cloud computing, connectivity, safety and security, and machine-learning assets to this collaboration enabling a truly end-to-end solution." Intel will be providing a slew of connectivity and internal tech, such as the system's processors, while Mobileye will be providing much of the sensing capabilities of the prospective autonomous vehicle. The Mobileye Road Experience Management (REM) system and their EyeQ5 system-on-chip sensing system will be utilized in the iNEXT. Highly Automated Driving (HAD) testing is slated to begin in 2017. This isn't the first time that BMW suggested that future Ultimate Driving Machines would be fully-autonomous, but it is their first foray into fully-autonomous vehicles.